“Recently I installed MAMP on my Mac and later I realized it was not the app I want, so I decided to uninstall MAMP PRO. But how can I completely delete MAMP from my hard drive?” A reader sent an email to us, asking for the answer to this issue. 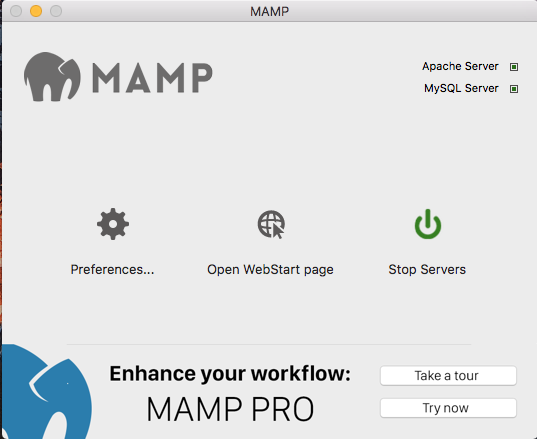 Once installed, MAMP creates a local server environment on your Mac. MAMP claims that users can simply delete the MAMP folder if the tool is no longer needed, and everything will return to its original state. But is it the truth? Let’s find out. Typically we can delete an unwanted app by trashing it from /Applications folder to the Trash. To test MAMP, we download this app from its official website and then install it into our testing machine. As a result, two folders labeled MAMP and MAMP PRO appear in the /Applications folder. So the next step is to delete the MAMP folder to the Trash (right click on the MAMP folder and choose Move to Trash option), and obviously it even requires no admin permission to complete the action. Note that you have to quit the app before performing the deletion. To do so, just right click the app icon in the Dock, and choose Quit option from the menu that appears. Now we come to the MAMP PRO folder. After double clicking to open up this folder, we found that the folder contains two items - one is the MAMP PRO, and the other is the MAMP PRO Uninstaller. It seems that the pro version comes with a dedicated uninstall tool, and in this case it is wise to utilize the tool to delete the app, instead of just deleting the folder like how we tackle with MAMP, the free version of this app. So we continue to double click on MAMP PRO Uninstaller. A wizard pops up, saying that this Uninstaller will “remove all folders and files belonging to the MAMAP PRO installation, including the MySQL databases that were modified while using MAMP PRO. If you don’t want to keep the databases, just click Uninstall button, and then you will prompted to enter the admin account password to allow this change. Wait for a few seconds you will be informed that “MAMP PRO has been uninstalled successfully”. So here comes the crucial question of this article: does MAMP PRO really disappear from your Mac without any trace left? Time to figure it out. Generally, most apps create preferences, caches, log files or other supporting files and scatter those components around the system. So first of all, let’s head to the User Library folder to see if MAMP leaves associated files there. Here’s how to do: in a Finder window, hit Command+Shift+G (or head to Finder > Go > Go to Folder), then type ~Library in the pop-up box, and hit Enter to access the directory. Here we share a little trick that many Mac beginners may not know yet. You can utilize the Search feature in Finder to help locate items you are hunting for. To do so, click the Search in the Finder window, type MAMP in the search box that appears, and then click the Library below the search box. Soon the files and folders that contain MAMP will appear, and you can easily delete the items pertaining to MAMP. After searching for items that contain MAMP keyword, we found that there still exist some MAMP components around different system directories, such as ~Library/Caches and ~Library/Application Support. That means, MAMP built-in uninstaller cannot guarantee a 100% removal of all its components as it claims. Well, looks like you have to manually delete MAMP remnants even after MAMP has disappeared from your Mac. But if you have installed a one-stop uninstaller, you can save the troubles in app removal tasks.